Notice the Sikorsky SH-3 helicopters parked alongside the con tower. 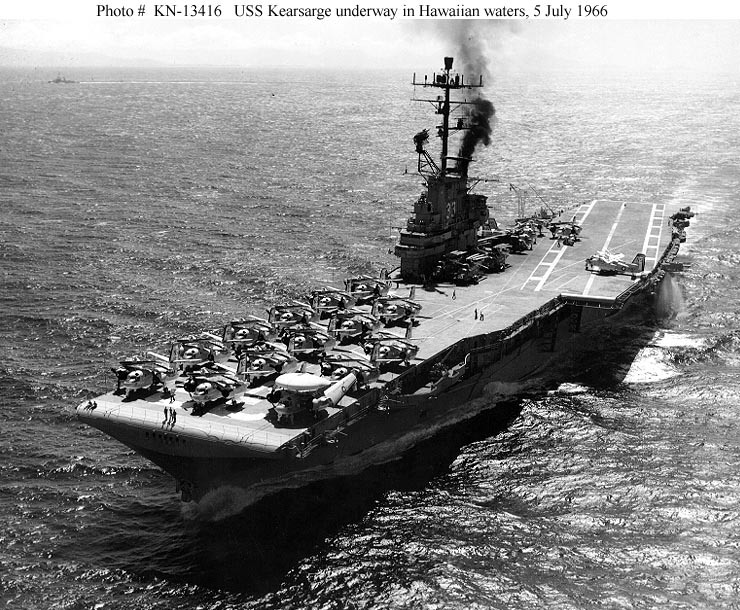 USS Kearsarge (CVS-33) underway in Hawaiian waters, 5 July 1966, with S-2 and E-1B airplanes and SH-3 helicopters on her flight deck. Photographed by Ph1(AC) R. Sheffield. Official U.S. Navy Photograph (photo # KN-13416). Armament 12 x 5"/38AA, 32 x 40mm, 46 x 20mm, 82 Aircraft. Armor, 4" Belt, 2 1/2" Hanger deck, 1 1/2" Deck, 1 1/2" Conning Tower. Speed, 33 Knots, Crew 3448.
by the New York Naval Shipyard, New York and commissioned 2 March 1946. March 1967, steaming off the coast of Southern California.